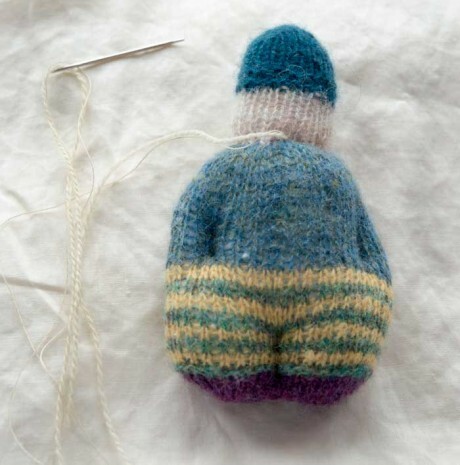 This is a tutorial specifically for making Bertie, from Juju’s Loops, in-the-round instead of knitting him flat. You need the book for the full instructions but this tutorial will help anyone who wants more information about making a toy. 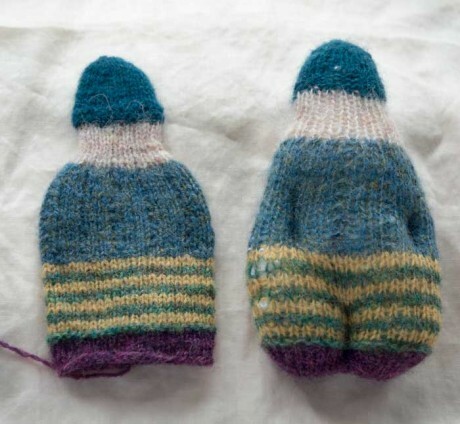 All Bertie’s are knit in Jamiesons Spindrift using the magic loop technique. 1. Begin with a figure of eight cast on, as in last week’s post. 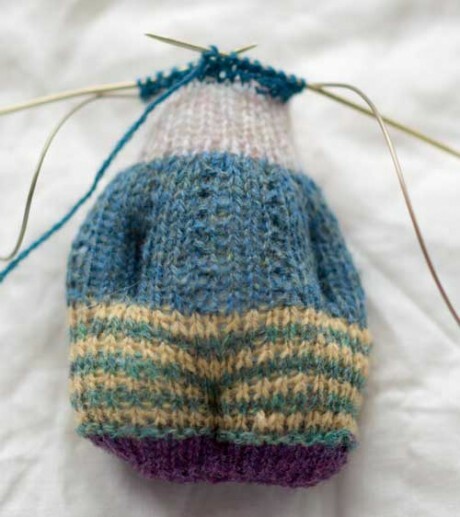 This means Bertie’s feet will be closed from the beginning and you won’t need to sew up his foot seam. 2. 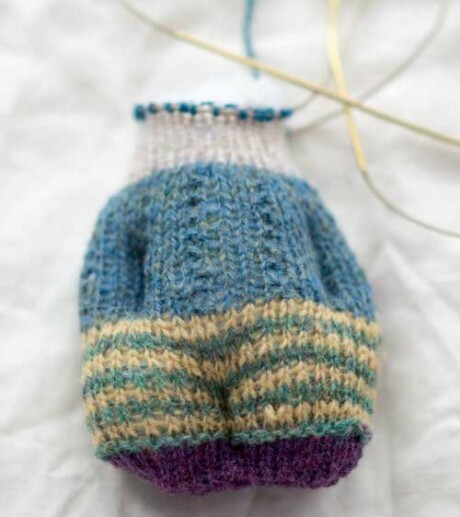 Continue knitting Bertie’s shoes and trousers in the round. 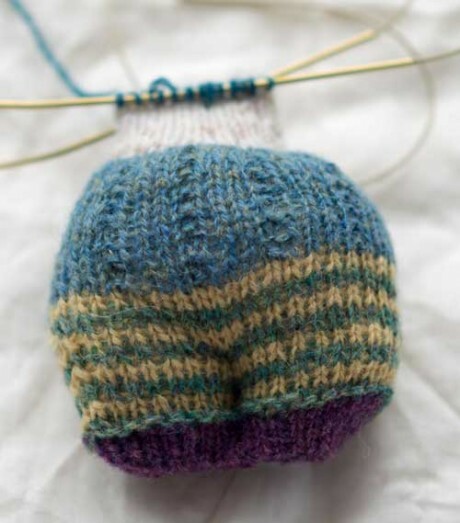 The garter ridge at the hem of his trousers will be knit with one row knit and one row purl, now that it is in-the-round. We’ve used a 2 row stripe for his trousers. Weave in all the yarn ends, as you go along. row 2: *k4, p1*, repeat *to*. 4. Continue into his head and the first row of his hat, as in the pattern. 5. Pause and sew the seam up the middle of his trouser legs. Ouch! Sewing up the indent between Bertie’s legs. We’ve added a sewing thread in with the spindrift so we can pull tight, without breaking the yarn. 6. Stuff Bertie up to his waist. The stuffing is bulging beyond his waistband (we know how that feels) but we’ve only stuffed up to his waist. 7. Sew the arm indents as indicated in pattern. The colour doesn’t match his body but it won’t show in the indents. 8. Stuff Bertie’s upper body and arms. Continue stuffing into his head. 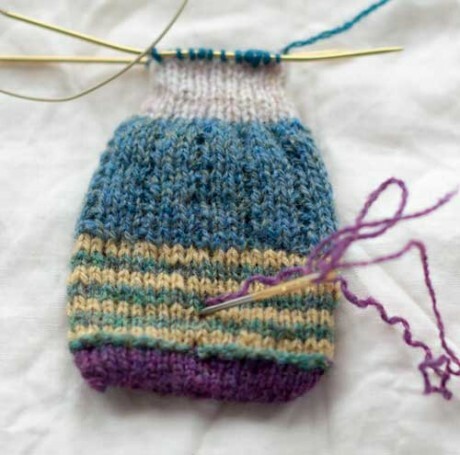 Use a pencil end to poke stuffing into the areas you want it. 9. 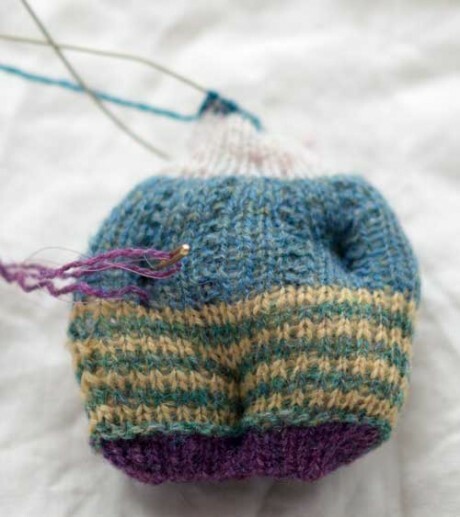 Continue knitting Bertie’s hat. 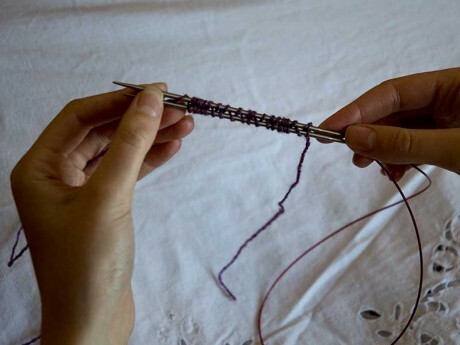 To work the first few rows in garter stitch, in-the-round, k one row, p one row. 10. Finish Bertie’s instructions up to the end of step 7. Give him lots of stuffing; don’t worry if he seems overly fat. We’ll give him cosmetic surgery later. His brains are popping out. Keep the zombies away! 11. 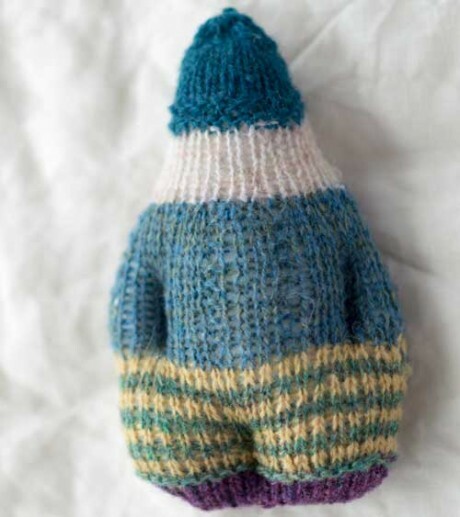 Complete knitting Bertie and seal him shut. 12. Shetland yarn, such as Jamiesons Spindrift, fulls beautifully. Fulling is a process of partially felting the surface of the yarn. To full Bertie, put him in the sink to soak, rub some soap on his exterior and lather, vigorously rubbing the wool on the outside. Alternatively, put him in the washing machine with your next load. 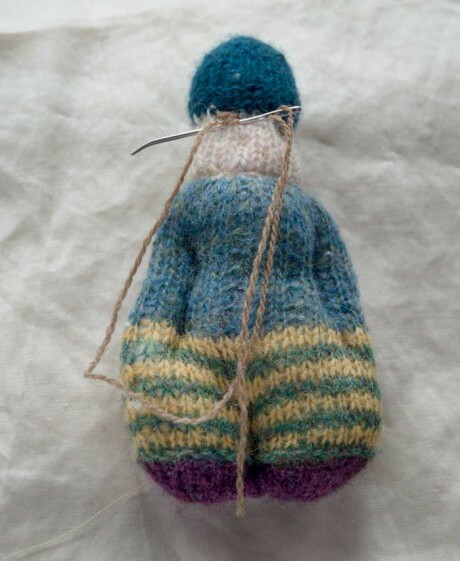 Although Shetland yarns full beautifully, they resist complete felting. Perfect for the machine. Allow him to air dry or give him some time in the tumble drier. 13. 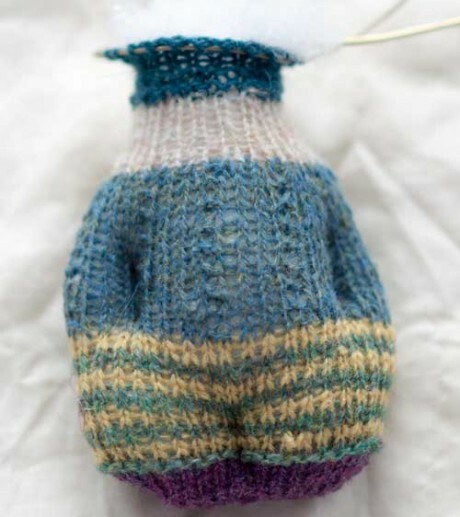 Alternatively, you can knit Bertie in-the-round, without starting him with a figure of eight cast on. 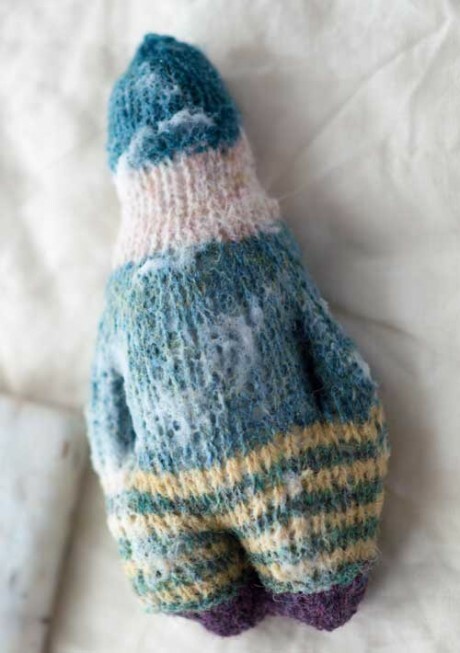 With his feet open, pop him in the washing machine to full and then stuff and stitch. Bertie on the left below has been made this way and he has fulled better. On the right, Bertie is all dried out after his martini. 14. Sew a running stitch around his neck to draw it in a little. 15. 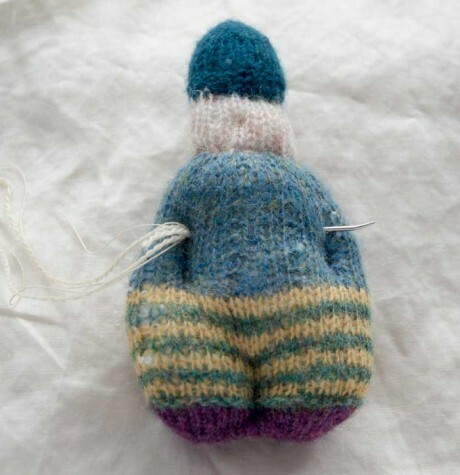 You can soft sculpt Bertie by plucking his stuffing into the areas you want it with the darning needle and then stitching it in place. Adding a bit more shaping to his torso with soft sculpting. 16. Stitch some eyes near the brim of his hat and a nose in matching skin colour. Some Bertie’s look better with a mouth. This one needed it. He’s not my best Bertie to date. I wish I had used the Spindrift doubled for a tighter tension. 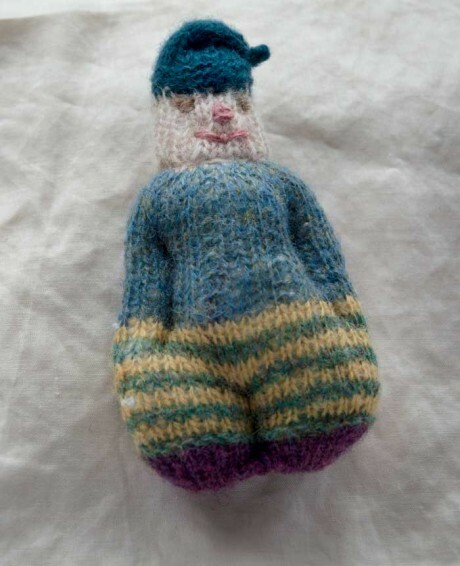 But I’m sure he’ll be lovely once I’ve knit him a scarf!